Who is the best NFL team in Florida? If you guessed the Miami Dolphins or Tampa Bay Buccaneers, then you're absolutely incorrect! The Dolphins haven't won a Super Bowl since former Owner Joe Robbie and Hall of Fame Coach Don Shula were running the show in the 1970's. There was some success in the 1980's and 1990's when Shula and QB Dan Marino were making the playoffs but couldn't attain championship status. All Marino did with Shula was pad his passing statistics with the likes of wide receivers Mark Duper, Mark Clayton and Mark Ingram Sr.
After Shula retired, Jimmy Johnson, who had two Super Bowl Championships on his resume with the Dallas Cowboys, couldn't convince Marino to accept having a balanced running and passing attack. As a result, their careers ended abruptly as the Jacksonville Jaguars mauled the Miami Dolphins 62-7 in the 1999 Divisional Playoffs in Northern Florida. The Miami Dolphins haven't sniffed much success since Shula and Johnson departed. They've only won two AFC East Championships since 2000. Excluding current Head Coach Adam Gase, the last full-time winning coach for Miami was Dave Wannstedt in 2004. His career mark with the Dolphins was 42-31. The Dolphins have been a dysfunctional organization and of the 12 head coaches in their history, they've employed eight since 2004 which includes interim coaches and now Gase. Alabama Coach Nick Saban was in this group as he coached the Dolphins from 2005-2006 and was 15-17. On Monday, December 11, 2017, the Tampa Bay Buccaneers honored former Coach Jon Gruden by inducting him into their Ring of Honor. The Buccaneers won a Super Bowl 15 years ago and since Gruden stopped coaching the team, they have gone through four coaches. Only Gruden and Tony Dungy have ever left their jobs in Tampa Bay with winning records. Current Coach Dirk Koetter was given one more season to develop franchise QB Jameis Winston, who you see in the photo in a game versus the Detroit Lions on December 10, 2017 at Raymond James Stadium. The only team remaining is the Jacksonville Jaguars. This is a team which finished the 2016 season with a 3-13 record and their transformation in the past year has been tremendous. The team fired Gus Bradley on December 18, 2016 and hired Doug Marrone as interim coach on December 19, 2016 for the final two games. Marrone finished the season with a 1-1 mark. Prior to coming to Jacksonville, Marrone had some success coaching the Buffalo Bills. As the team's head coach in 2013-2014, the Bills were 15-17. In his first season, Buffalo was 6-10 and in his final campaign, the Bills improved to 9-7. After the 2014 season, Marrone had a three day out clause in the event of an ownership change and he quit on December 31, 2014. What a difference two years makes since departing Buffalo and Marrone took over the interim job. Back in January, former Jacksonville Coach Tom Coughlin was hired as the Executive VP of Football Operations. He wasted no time hiring Marrone full-time on January 9 as Doug become the fifth head coach in franchise history, thus the culture change was underway. The 71-year old Coughlin made his impact on the team in the NFL Draft by selecting LSU standout running back Leornard Fournette in the first round, fourth overall. Coughlin and Marrone's impact was known as they suspended Fournette for one game because of disciplinary problems. 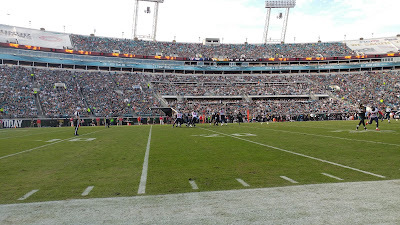 When we went to Jacksonville on November 12, 2017, the Jaguars faced Melvin Gordon and the LA Chargers. Their defense limited Gordon to just 27 yards and as a result defeated the Chargers 20-17 in OT. This was Jacksonville's third straight win and doubled it's total to six by improving to 6-3, while the Chargers dropped to 3-6. It was a hard fought contest, but the Chargers would go on a four-game winning streak before losing to the Kansas City Chiefs Saturday, December 9, 2017, 30-13. The Jaguars only loss since we attended the Chargers game was on the road to the Arizona Cardinals, as they lost 27-24 snapping a four-game winning streak. Cardinals kicker Phil Dawson kicked a career long 57-yard field goal. Jacksonville would go on and start a new winning streak that had reached three. Before the Chargers game, there were rumors that the team was considering bringing in Eli Manning to rejoin Coughlin in 2018. That talk has definitely subsided with the recent offensive explosion and continued development of QB Blake Bortles. In addition to Marrone, Offensive Coordinator Nathaniel Hackett and QB Coach Scott Milanovich have been a major part of Bortles development. The Jaguars have won three straight home games starting with the Indianapolis Colts 30-13, Seattle Seahawks 30-24 and when we were there Sunday, December 17, 2017, they thrashed the Houston Texans 45-7. This game was over by halftime as Jacksonville led 31-0. The Texans self destructed by committing 14 penalties for 127 yards. In the two games Jacksonville won against the Texans, in week one and fifteen, they outscored Houston 74-14. In the home win, the Jaguars inserted former Michigan QB Chad Henne into the line-up for mop-up duty at the 12:33 mark in the fourth quarter with a 38-7 lead. Going into their week sixteen contest on the road against the San Francisco 49'ers, patience has paid off for the Jaguars coaching staff as this recent three game winning streak has seen Bortles throw seven touchdown passes and zero interceptions. Bortles has performed to a career high 89.7 QB rating to date. Against the Texans, Bortles threw for 326 yards and three touchdowns and had a QB rating of 143.8. Once again, there was no talk about Eli Manning in the press box, just the maturity of this fourth year pro from the University of Central Florida. Texans Coach Bill O'Brien noticed improvement from Bortles since the beginning of the season. "He played a good game, he's had a good year," O'Brien said. "Give him a lot of credit. You know he's had a good year for them, and they've got him playing real well." Fournette missed the game due to a quad injury but as indicated by the lopsided score, the Jags didn't need him and the rookie running back had a week of rest. Keelan Cole had a career day by catching seven passes for 186 yards and one touchdown. Jaydon Mickens, who was recently on the practice squad and was sleeping in his car at Ever Bank Field, made sure with his performance he won't have to do this again. He amassed four receptions for 61 yards and two touchdowns. This has been a very touching story especially hearing about this during the holidays. During the Jags three game home stretch, they had two sellouts and have now clinched their first playoff spot since 2007. The parking lots are getting filled with tailgaters and this town is on the verge of erupting. When there was a shot of Coughlin in his private suite shown to the crowd, the stadium erupted. These fans know he's behind the resurrection of this incredible turnaround. But at what point during the season did people start taking this team seriously? When you walk into Pittsburgh on October, 9, 2017 and whip the Steelers 30-9, it's time to start paying attention. Fournette had 28 carries for 181 yards and two touchdowns and set a franchise record with a 90-yard touchdown run. Jacksonville's defense hammered Steelers QB Ben Roethlisberger on this day. He was 35-55, 312 yards and threw five interceptions. This win enabled Jacksonville to improve to 3-2 as it matched its win total of 2016. A week later, the Jaguars lost to the LA Rams 27-17, but Fournette still amassed 130 yards including a 75-yard touchdown run. Despite missing three games, Fournette has been a force on offense as he's rushed for 971 yards and has 235 receiving yards leading to 1,206 all purpose yards producing 10 touchdowns. There is no doubt he'll be a strong candidate to win Rookie Of The Year Honors. In the Jaguars win against Seattle, this was the first time they defeated an opponent that was entering the game at least four games over .500 since week 15 of the 2007 season (Pittsburgh). The 2017 season can be summarized in different ways as there have been many firsts in what's been viewed as a remarkable turnaround. After the thrashing of the Texans, Jaguars Owner Shad Khan was the happiest man in the stadium after his team clinched a playoff berth. "It's unbelievable. To win it and win it the way we did today, mind-blowing and I'm really grateful, obviously and proud of the players," Khan said. "The football leadership and the fans, especially the last two games, have given us the energy, put it over the top. It's been awesome." Khan knew that the fans would return to the stadium when the team started to make it worthwhile. "It's been awesome. It's been awesome," Khan said. "We've had standing room tickets today, which certainly hasn't happened in the almost six years I've been here, so it's wonderful. The energy in this stadium, you can't replace that, and that's why we need the fans." Khan was asked if he thought success would come this soon after bringing Coughlin back. "I'm always an optimistic guy, " Khan said. "And certainly, whatever I was hoping for, it's that and more." Khan had a ton of praise for his signal caller Bortles. "I think it's been incredible," Khan said. "I think the stats show that. He's been kind of different, more confident person, and he's providing the leadership we all want out of him." The entire theme after the game was about the fans coming back especially since this was Jacksonville's final home game of the regular season. Marrone was asked if this team feeds off the crowd? "No doubt. No doubt. No doubt," he said. "When you play late in the year and you need to win football games and you have a great crowd that is ready to go, that helps," Marrone said. "I've been saying that for weeks. I think that through this time that all the work that this team has put in, I've said before, we're trying to earn the, I don't know what the right word is, of our fans. I guess we want to be able to go out there and be able to perform and have them be proud of our performance." During the course of the week, it's been interesting to see the National Media's reaction to Jacksonville's turnaround. While I'm not in the immediate local media, thanks to my Great Friend and Jaguars Senior VP, Communications, Dan Edwards, he's been great by credentialing Myself and Ebling when we come up to the area. It would be hard to find a nicer and classier person than Edwards!! Thankfully, he always seems to find space for us. But during the last two seasons, we've covered four games, two per season, and it's very easy to gain a pulse on the progression of this franchise as I see myself as somewhat of an insider and look forward to continuing to working with the Jaguars in the future health permitting. Marrone was asked if the Us Against The World is a good description of this team. "I've said before people on the outside might feel that way," Marrone said. "I don't use 'us against the world' per se. I talk about putting in the work, gaining the respect and the only way to do it. You know, good football teams win in December. We're just trying to keep pushing the players to be better and not really riding any theme like 'us against the world,' because it's not. We have our fans. We have the other side of the building in the business section of it. We have our media. We have a lot of people that are with us. So maybe it's all of us against the world." Bortles will be making his first playoff appearance and he's using the rest of the regular season to improve his game, he's definitely looking forward to playing post-season football. "It feels good. Obviously, I think everyone knows the history of the organization to be able to say that we are part of the group that kind of changed the culture and changed the narrative about the Jaguars is special," Bortles said. "I think it's a never ending battle. You do it one week or you do it for a couple weeks or for one season. It's something we have to find a way to make consistent on a weekly basis and on a yearly basis." 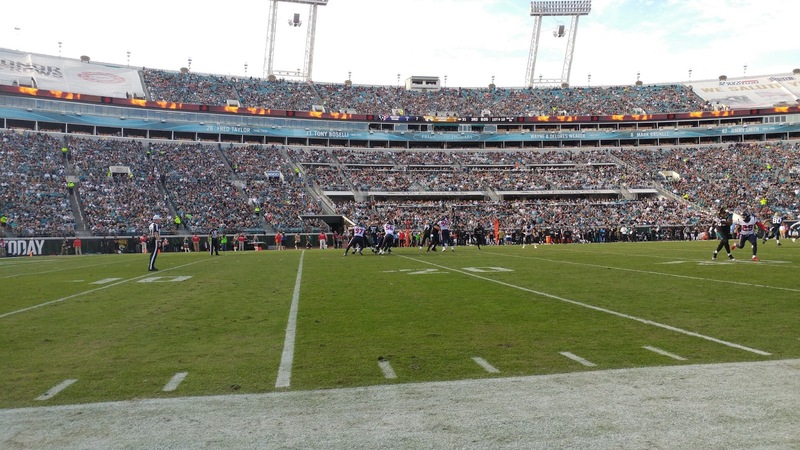 Bortles added that he's pleased the crowds are coming back. "It all comes with winning," he said. "I think that is the main thing, that is the main key, the main ingredient. People want to come watch a team win. They want to be part of a winning organization. Now that we are able do do that and give them that and put a good product out on the field that they can come watch, I think it only makes it more exciting for them. To be able to do it in front of them and have them be as loud and cheer like they did in the playoff change at the end. It's pretty cool and surreal." Against the Texans, Jacksonville's defense once again made life difficult as Houston amassed only 186 yards in total offense. Overall, the Jaguars lead the NFL with 879 tackles and 52 sacks. This defense will be a force to be reckoned with in the playoffs. Texans QB T.J Yates was running for his life all afternoon and was sacked four times. Yates only touchdown was to standout wide receiver DeAndre Hopkins for 25 yards shown in the photo, Hopkins would finish the afternoon with four receptions for 80 yards and a touchdowns. This kid is a stud and will be a superstar for many years to come. During the season, the Jaguars have been hit with numerous injuries, losing wide receivers Allen Robinson, Dede Westbrook and Allen Hurns but they continue to play through these using the next man up. Jacksonville added defensive tackle Marcell Dareus to bolster their defense. There is a saying that defense wins championships and I'll be curious to see how Jacksonville's will fare against the elite QB's and offenses come playoff time. It will also be interesting to see the continued progression of Bortles. But as I look at the tale of two seasons between Houston and Jacksonville, it can be summarized in this respect. Houston lost defensive standout J.J. Watt earlier in the season and then their QB of the future DeShaun Watson succumbed to a season ending ACL Injury. Prior to Watson's injury, he threw for 1,699 yards and 19 touchdowns and eight interceptions. He also rushed for 289 yards and added two more touchdowns. With a 4-11 record to date, it would be unfortunate to see Texans Coach Bill O' Brien to lose his job come "Black Monday, January 1, 2018." As for Jacksonville, it's hard to believe that a year ago, this squad finished with a 3-13 mark and was a laughingstock. Khan found this term rather enlightening and said, "Well, I've been through life when I was a laughingstock in whatever business I was in, auto parts or what have you. You have to stay in it and success comes. It's a story of perseverance." Truly, I think the Jaguars are on house money because nobody expected them to be where they are now so anything they accomplish is a building block. In my 39 years of covering sports, I've covered numerous championship teams and it's always a building process to reach elite status and maintain it. It will be interesting to monitor the Jacksonville Jaguars over the coming weeks. The Jaguars and their fans have had a tough task as they faced the San Francisco 49'ers , who are playing much better with the acquisition of Jimmy Garoppolo from the New England Patriots. Against the Jaguars, Garoppolo threw for 242 yards and a touchdown to lead San Francisco to its fourth consecutive win. As for Bortles, he threw for 382 yards, two touchdowns and one interception as his squad dropped to 10-5. The 49'ers defeated the Jaguars 44-33. But the big news of the day was the LA Rams defeating the Tennessee Titans in Nashville. For the first time since 1999, The Jaguars have clinched the the AFC South Division. As a result, the 10-5 Jaguars will host a playoff game for the first time since 1999. It's been announced that they received permission from the NFL and their sponsors to remove the tarps in the upper level of EverBank Field and sell those tickets for their home playoff game next week. are sold on a season-long basis. to sell out according to the team. The Jaguars are Florida's Best NFL Team and I don't see the Miami Dolphins or the Tampa Bay Buccaneers catching up anytime soon! If you're looking to keep your head coach employed, Lions QB Matthew Stafford knows the formula. After throwing for 381 yards and a touchdown on December 10, 2017 on the road to defeat the Tampa Bay Bucs 24-21, Stafford had some interesting things to say about Coach Jim Caldwell's future. "Listen man, we go out and play and he goes and coaches," Stafford said. "He understands part of the business, we understand, who knows. I'm not on social media so I don't give a crap but we just go play, man. We go play, he goes and coaches, our job is to win football games. That's what we're trying to do." Against the Chicago Bears Saturday, December 16, 2017, Stafford's 237 yards and two touchdowns performance led Detroit to its second consecutive victory 20-10. Detroit's record improved to 8-6 and the Lions continue to remain in the playoff hunt. Lions Coach Jim Caldwell is guaranteed of the team at least finishing with a .500 record. After the Buccaneers game, the head coach addressed his job security and you can rest assure that anybody who addressed it Saturday would get the same answer we received in Tampa pertaining to his contract expiring at the end of 2018. "We never, never ever, ever been in the practice of talking about contracts and anything of that nature, and we're certainly not going to start today," Caldwell said. "There's no (security) it's coaching. That's the way it is." As for what's ahead for the Lions, on Monday Night, the Atlanta Falcons defeated the Tampa Bay Buccaneers 24-21 to improve to 9-5. Detroit remains one game behind Atlanta but the Falcons need some holiday cheer to get into the playoffs. On Christmas Eve, December 24, 2017, Atlanta travels to New Orleans to take on the high powering Saints (10-4). We all know how dangerous QB Drew Brees is, but the two headed running back monster combination consisting of Mark Ingram and Alvin Kamara are good enough to shred any defense. Ingram has rushed for 1,045 yards and 11 touchdowns. He's tallied 375 receiving yards. Meanwhile, Kamara, has 652 yards carrying the rock with seven touchdowns. He's been an explosive receiver out of the backfield adding another 684 yards and five touchdowns. Detroit needs this dynamic duo to have a big day. On December 31, 2017, Atlanta faces Carolina QB Cam Newton, who is playing some of his best football leading the Panthers to a 10-4 mark, in Georgia. In the Panthers 31-24 victory over the Green Bay Packers, Newton threw for 242 yards and four touchdowns. He had one of his favorite targets back as Tight End Greg Olson caught nine receptions for 116 yards and a touchdown. The Lions lost to Atlanta, Carolina and New Orleans, therefore the head-to-head tiebreaker works against them. Detroit's playoff hopes rest firstly on them taking care of business. First, the Lions have to win out against the Cincinnati Bengals, who just got crushed Sunday by the Minnesota Vikings 34-7 on the road. Like the Tampa Bay Buccaneers, Cincinnati (5-9) could be looking for a new head coach when "Black Monday" takes place on January 1, 2018. Second, they also need to beat the Green Bay Packers. With the Packers (7-7) now out of the playoffs, despite 290 yards and three touchdowns from Aaron Rodgers, the future Hall of Fame QB took a pounding against the Panthers which led to three interceptions. Rodgers missed eight weeks because of a broken collarbone. He woke up very sore on Monday and appears to have aggravated the injury returning too soon. Rodgers was put on season-ending injured reserve and Brett Hundley will be under center when the Lions play the Packers December 31, 2017 at Ford Field. Also, will the game be changed to a later time than it's current 1 pm slot and be on National TV? In the past few years, when there have been playoff implications, the game time has been switched. But once again, Sunday's action will give us more answers. If Detroit loses at Cincinnati, then none of what we're discussing means anything. So the question remains, will Santa Claus deliver the Lions two victories and the Falcons two losses? As for Caldwell, I'll continue to say this as I have all year. If you fire him, who are you going to replace him with? Are you going to bring in New England Patriots Offensive Coordinator Josh McDaniels, who worked with General Manager Bob Quinn in Massachusetts? Even if this happens, there are no guarantees that this move would work. McDaniels could be heavily coveted as 5-10 teams could be looking for head coaches on Black Monday, January 1, 2018. The only other candidate who might make sense is Tampa Bay Buccaneers Defensive Coordinator Mike Smith. Smith Coached the Atlanta Falcons from 2008-2014 and was 66-46 with a .589 winning percentage. He led the Falcons to five playoff appearances and was 1-4 in the post-season. Unfortunately for Smith, he was 10-22 during his final two campaigns which led to his dismissal. Aside from that, as I've written about before and I'll say it again, the Lions best move pertaining to Caldwell is to keep him. Since he was hired in 2014, Caldwell is 35-27 with a .564 winning percentage and two playoff appearances. Detroit's issues go deeper than the coaching search. The Lions need to start by bolstering their running back position, because the only stats which are missing are lack of 100 yard games, in addition to 1,000 yard seasons. Against the Bears, The Lions amassed 91 yards on the ground as a group led by Theo Riddick's 49 and Tion Green's 35. Unlike many teams in the NFL, the Lions are fortunate they don't need to look for a franchise QB. They have a young gunslinger and stud in Stafford, 29, who is the ultimate competitor and plays through injuries. Going into the Cincinnati contest, Stafford has 2,966 career completions and 34,223 yards. He has 212 touchdowns and 117 interceptions. He could hit the 3,000 milestone for completions against the Bengals. Otherwise, he'll attain that milestone against the Packers. Against Green Bay on December 31, 2017, Stafford will have played in all 16 games since 2011.
Who would have ever have thought that back on December 19, 2010 that Detroit snapped a 26-game road losing streak at Tampa Bay. How times have changed as Detroit enters its road game with Cincinnati with a 5-2 road record and is 3-4 at home. It's safe to say that road win number six, will be huge! This is What's Ahead For The Lions. There are no shortage of memories when I cover a Lions vs Tampa Bay Buccaneers road game. Whether the venue is the demolished Tampa Stadium or Raymond James Stadium, there have been some nice story lines. On Sunday, October 12, 1997, I remember wishing Lions Hall of Fame running back Barry Sanders luck at the team hotel in the morning where we were staying. Barry in his polite way, said thanks and shook my hand with a smile. That day, he wasn't shaking any Tampa Bay Bucs players hands, just having their defenders shake their heads as he became the first player in NFL History to record two 80-yard TD runs in the same game. He broke off an 80-yard scoring play late in the first quarter and added an 82-yard touchdown romp in the third quarter, finishing the day with 215 yards. The Lions won the game 27-9 in Tampa Stadium and even though there is no cheering allowed in the press box, it was hard to confiscate media credentials during such an incredible and memorable performance when we all cheered. At the time, My longtime friend Chip Namias was the Director of Media Relations of the Buccaneers, and I told him after the game that it was neat to be a part of this type of history. Chip smiled and agreed that it was an unbelievable day. I have made other appearances in Raymond James Stadium including covering a Super Bowl featuring the Pittsburgh Steelers vs the Arizona Cardinals. But one regular season game that stood out occurred on December 19, 2010 as Detroit ended a 26-game road losing streak when they claimed a 23-20 overtime win at Tampa Bay. The Lions would proceed to win another road game in Florida as they defeated the Miami Dolphins on December 26, 2010, 34-27. Detroit was 2-0 in The Sunshine State in 2010. Here on December 10, 2017, the Detroit Lions had another important contest as they attempted to keep their playoff hopes alive. Coming off a pair of losses to the Minnesota Vikings and Baltimore Ravens the past couple weeks, there were no shortage of story lines. There is always speculation of Coach Jim Caldwell's job status, and this week, QB Matthew Stafford has been battling a hand injury. Detroit entered the game with a 6-6 mark while Tampa Bay was 4-8. The Lions came away with a 24-21 win as Matt Prater booted a 46-yard field goal with 20 seconds left to play as Detroit improved to 7-6. The Lions got an early Christmas gift as Tampa Bay committed five turnovers. Detroit also benefited from two successful replay challenges. Stafford was 36-44 for 381 yards and a touchdown. He knew that Detroit better not look past the Buccaneers or any chances of getting into the playoffs wouldn't occur. "Yeah, you throw the tape on these guys and they're talented, they're extremely talented," Stafford said. "They got a lot of guys at every level on the defense, 93 (Gerald McCoy), 54 (Lavonte David), 24 (Brent Grimes)--they got guys that can wreck the game, and really make big plays, and they did some today. "And then our defense having to defend that offense, I mean, Jameis (Winston) is as talented as anybody in the league and they've got some big-time receivers and tight-ends, have a good running game. This is the NFL; we know every time we show up on a Sunday it is going to be a big one." When asked about the Lions being able to make plays in the last minutes of games, Stafford added, "I just think we have a lot of confidence. I think guys that have been around here have understood that's kind of sometimes the way the game boils down and we go out there and make plays and when you have success, it breeds confidence. "Frankly, there's been times this year where we haven't been successful in those situations, some close calls in some other games. It feels good to get back out there and have a two-minute drive, go out there and win the game." Caldwell deflected any talk about his job security as he has so many times during his tenure with the Lions especially when a report surfaced that his contract was guaranteed through the end of the 2018 season. Caldwell praised Stafford and was relieved to get an important win. "Yeah, tough guy. Tough guy who heals real quickly," Caldwell said. "Really, it's always been that way. He's a great leader and did a tremendous job out there for us under some tough circumstances, I should say. "You know, it was a key win for us. It was key for us to play a team that is very hard to beat in this stadium with Jameis back there playing. They've got weapons. They've got people that can run. Overall, it's a talented team. If you can get one on the road in this league, it's a good thing." There has been no shortage of close games in Caldwell's coaching stint in Detroit and this was no exception. "It's been a hallmark of ours," he said. "We've been able to battle at the end. Our guys show great resiliance, and they don't get nervous in tough situations at the end of games. They find a way to win it. It might not always be pretty---we'd always been like that---but we lost a few this year just the opposite the side of that. "Atlanta, Carolina, and a couple others that were close right there at the end. We weren't able to finish them, so we have been uncharacteristic in the middle portion of the season. So hopefully we can see if we can continue to do that and be a little better this next week." The one thing which has always been consistent when I attend a Lions game in this area is there is no shortage of Detroit colors on display. Sunday was no exception. There are a lot of transplants from Michigan that live in the Tampa Bay Area and the Tigers train 45 minutes away in Lakeland. One puzzling inactive was Detroit running back Ameer Abdullah. Once again, Caldwell wouldn't get into too elaborate of an answer when it came to why he sat him and what the future holds into using him as a feature back. "We don't go into details about everything, but obviously he's still nursing an injury," Caldwell said. "He's coming a long. I think he'll be ready to go here shortly. We don't talk about number ones, number twos. That's you guys business. We have a three man rotation. With the three guys that we have up, all three guys play." With Abdullah inactive, the Lions rushing attack mustered up only 53 yards, led by Theo Riddick, who amassed 29 yards and two touchdowns. There is no doubt there will be continued talk about Caldwell's employment status and he is focusing on the Lions next opponent, Chicago. Stafford was having no part of this conversation after the contest. There is no shortage of drama in the Tampa Bay locker room as a report surfaced that Winston's relationship with Coach Dirk Koetter is deteriorating. The Bucs 4-9 record is going to do nothing to quiet that talk regardless of what Winston said. The loss to Detroit eliminated Tampa Bay from the playoffs. My sources say that Koetter will be terminated at the end of the season. On Monday, December 18, former Coach Jon Gruden will be inducted into the teams Ring of Honor as he coached the team from 2002-2008, compiled a 57-55 record and led the franchise to it's only Super Bowl Title. One person who should be in The Bucs Ring of Honor is Tony Dungy. He led Tampa to a 54-42 mark and his squads made the playoffs in four of his six seasons at the helm. Dungy is Tampa's all-time winning coach with a .556 percentage. You can rest assure, there will be a lot of talk about bringing Gruden back to roam the sidelines at Raymond James Stadium. I've always thought highly of Gruden as a head coach, but in reality, he won it with the talent Dungy molded together. If Tampa Bay was smart, they should try to get Dungy to leave his cozy seat at NBC and return to coaching. Tampa Bay QB Winston threw for 285 yards and a pair of touchdowns. But on this day, Winston refused to speculate on Koetter's job status. "I don't control that. That's not my place. I play quarterback for this organization, that's all I play," Winston said. "When you lose, everything gets blamed on one guy: the head coach and quarterback and I'm ok with that. I'm pretty sure Coach Koetter is ok with that. We don't care about that stuff. All we care about is each other, our family and trying to win. "I've been with Coach Koetter since I've got in this league and he has not wronged me since I stepped foot in those doors. We have a great relationship first and foremost. "I believe in what we have in what we have as an organization. We've got talent. Some unfortunate things happened. That's life. That's football. Some people can blame it on this, some people can blame it on that. But at the end of the day, we've got to win. As long as we are winning, no one is sitting here asking me questions about me and my head coach. No one." Koetter also addressed the reports about him and his quarterback and said, "It's obviously news to me. I think Jameis and I have had an extremely consistent relationship for the last three years. I don't think anything is different about it, but it's just my opinion. "What concerns me is that we aren't winning enough games. That's my biggest concern. I mean, I know about our relationship, but my biggest concern is our football team." On January 1, 2018, the Michigan Wolverines face the University of South Carolina Gamecocks in the Outback Bowl in this very stadium. The question remains which one of these coaches will be employed by either of these organizations. But to Caldwell's credit, he's been facing job uncertainty for quite some time and always finds a way to keep winning to quiet that talk. He follows like Morris The Cat and has Nine Lives. At least Stafford always has his back and this gunslinger will continue to battle through what he calls "Crap" as this duo works towards its goal of reaching the postseason. To be frankly honest with you, I'm sick and tired of writing about Caldwell losing his job because as I've mentioned before, he's one of the best coaches Detroit has had in years. If Detroit does terminate him, unless General Manager Bob Quinn were to hire Josh McDaniels away from his former club the New England Patriots, and that's no sure bet it would work out, who would the Lions bring in to get better? It will be interesting to see how the rest of the season plays out. But all the Lions have to do is simply win games and there next three opponents are the Chicago Bears, Cincinnati Bengals and Green Bay Packers. very well be back in the lineup. But as the old adage says, it's important to take these games one at a time. But as I take a moment to reflect on this game, the Lions did get another three point win that nearly went to overtime and it was an exciting finish. For myself, it was great seeing my old Tampa Tribune colleagues Roy Cummings and Joey Johnston again. We worked together from 1984-86, but it seems like yesterday that we were all covering High School Sports. As a University of South Florida graduate, it was nice to be back in my old stomping grounds doing what I enjoy doing and that's covering Pro Football.